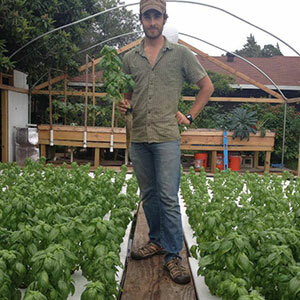 Michael Hanan harvests aquaponic basil at Ten Acre Organics. Photo courtesy of Ten Acre Organics. Ten Acre Organics began as the abstract vision of a few friends in Austin, Texas. Hanan and fellow classmate Lloyd Minick began the farm in earnest in 2012. Currently, the farm is housed on a tenth of an acre residential plot in Austin. Although it is tiny, the startup hopes its method of integrated, closed loop farming that combines field plants, aquaponics, live animals and a small CSA can act as a model for productive urban farming around the nation. The farm’s small size has allowed the partners to formalize their integrated growing system. Food production, community education as well as the size of their CSA are anticipated to grow in proportion to the farm. “As we have an integrated farm model, we view our work as having somewhat of an integrated impact, in that lots of little changes work together to create a systemic change,” explains Hanan. With field crops fertilized by the free-range chickens, fruit trees pollinated by honey-producing bees, and Tilapia providing nutrients for leafy greens and herbs, the entire farm is about closing loops, minimizing waste and increasing efficiency in a limited space. By sharing their ideas with the local community through workshops and farm tours, the farm hopes to use a combination of social media and word of mouth to spread their ideas. Micro greens and herbs are growing inside two aquaponic greenhouses for sale to local chefs. One setup is comprised of a repurposed carport containing 64 square feet of grow space and a 250-gallon tank. A second system boasts a 1,000-gallon tank and 350 square feet of grow space. Both aquaponics systems are a hybrid between media beds and deep-water culture. The type of crop and its growth rate determine which system is more appropriate for production. Beside the challenge of weather every farmer faces, Ten Acre Organics has discovered some of the roadblocks in funding a sustainable business. A second fundraising campaign will take place in late spring of 2014 to fund purchase of the ten acres of land necessary to make this Austin company’s full vision come to fruition. After establishing their first farm in Austin, Ten Acre Organics hopes to take their farming model across the state and one day around the world.